You are here: Home / CCCR Business 100 Blog / Nine added to the CCCR Business 100! 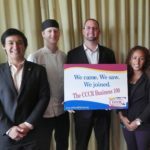 Nine added to the CCCR Business 100! Collier Child Care Resources’ mission is to provide high quality early childhood care, education and resources to children, families and early learning professionals in Collier County. CCCR served 275 children in 2015-2016 in its early childhood education programs. The contributions of the CCCR Business 100 group directly benefit some of these children by providing tuition assistance, equipment and supplies. Many of the children who attend the programs are at risk for academic failure and come from lower-income working families, with some living at or below the poverty level. Charlie McDonald Photography, Inc. Founded in 2000, Charlie McDonald Photography Inc., was founded by Charlie McDonald, a nationally published and award-winning photographer, recognized for his work with celebrities and Fortune 500 companies. Charlie McDonald Photography, Inc. and its team of professional photographers offers corporate and event photography in addition to weddings, family portraits, restaurant/food and an architectural/real estate division. Healthcare Network of SWFL – Founded in 1977, the non-profit Healthcare Network of Southwest Florida provides primary health and dental care to over 60 percent of Collier County’s children as well as family care, women’s care and behavioral care to over 48,000 patients (over 36,500 of whom are children) through its 21 facilities from Immokalee to Naples to Marco Island. Naples Luxury Imports Located in Naples, Florida, Naples Luxury Imports offers sales of luxury vehicles including Aston Martin, Bentley, Maserati, Rolls-Royce, Jaguar and Land Rover as well as a comprehensive service department. Naples Luxury Imports serves the Southwest Florida community, including: Marco Island, Naples, Naples Park, Bonita Springs, Estero, Fort Myers, North Fort Myers, Sanibel Island, Captiva Island, Cape Coral, Port Charlotte, Punta Gorda, Sarasota, Siesta Key, Bradenton, Clearwater, St. Petersburg, and Tampa. Purpose Journey provides consulting, training and coaching services in the areas of organizational culture, leadership development, team effectiveness and stakeholder communication and engagement. Purpose Journey president Lisa Gruenloh has a passion for helping organizations and individuals achieve sustainable success – success built on the foundation of their unique strengths, values, and purpose and the willingness to cultivate positive, often difficult personal and organizational change. She has more than 20 years experience driving results for a variety of private, public, and non-profit organizations throughout the country. Seasons 52 – Seasons 52 is a fresh grill and wine bar that offers a seasonal menu inspired by local farmers’ markets. Operating since 2011, and located on Tamiami Trail, its cuisine features rustic cooking techniques, including brick-oven roasting and open-fire grilling over oak and mesquite. The menu is paired with more than 100 wines, 52 available by the glass, along with artisanal handcrafted cocktails. Seasons 52 operates under the Darden family of restaurant brands that include Olive Garden, LongHorn Steakhouse, Bahama Breeze, Seasons 52, The Capital Grille, Eddie V’s and Yard House. Sherwin -Williams – Six retail stores are located in Naples, Florida with others in surrounding areas. For nearly 150 years, Sherwin-Williams has been an industry leader in the development of technologically advanced paint and coatings. It is the nation’s largest specialty retailer of paint and painting supplies with service at its more than 4,000 neighborhood stores across North America. Shula’s Naples – Shula’s Steak House Naples opened locally in 2009. Named after famed former football coach Don Shula, who serves as an equity partner in the steakhouse chain, Shula’s Steak House offers custom center cuts of Premium Black Angus Beef, accompanied with our aging process, to make up our award winning SHULA CUTS. Shula’s Naples has been named Choice Champion by readers of the Naples Daily News for best steak house, best burger and best lunch since 2009 and Best of Gulfshore Life magazine since 2004. National honors for Shula’s include the Wine Spectator Award of Excellence since 2006, the OpenTable Diners Choice Award since 2009 and the TripAdvisor Certificate of Excellence since 2010. Soukup Strategic Solutions, Inc. – Founded in 2012 by the company’s president, Sheryl Soukup, the company provides nonprofit organizations with expertise in fundraising and nonprofit management. The primary services of the company are strategic planning, board development, grant writing, and the development of fundraising and marketing plans. Additional services include focus groups, program development, event planning and meeting facilitation.